Brexit means higher borders, more xenophobia and racism in public life, and a victory for the far right around Europe. It is bad news for our movement, and all the oppressed: just look at the spike in hate crimes against women, disabled and LGBT people that took place after the 2016 vote, as well as a spate of racist and anti-migrant attacks. 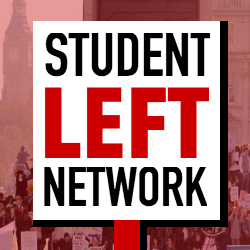 Our movement needs to loudly oppose Brexit, hand-in-hand with trade unions on our campuses. We need to be a voice of solidarity and hope for all those migrants, families and workers who fear for their future because of Brexit; and we need to offer alternative answers for those who voted Leave as a protest in 2016. I agree with the IWGB. But we can’t simply remain in the EU as it is. From the shores of the Mediterranean to neoliberal economic policies that wreck the lives of millions, the EU needs to be radically transformed. But we can’t do that from the outside. And by meekly accepting Brexit because we’re afraid of the racists, we won’t help a single migrant struggling to cross Europe’s borders. If we roll over and let the Rees-Moggs and Farages turn Britain into a super-sized, unregulated tax haven, we won’t be helping anyone rebel against EU austerity. NUS needs courage and internationalism, not weasel-worded cowardice in the face of bigotry. Stop Brexit!